Not only is the Port of Oslo Norway�s largest general cargo port and its leading container and passenger gateway, it is also located at the centre of the capital�s industrial and commercial heartland. Most of the consumer goods and industrial cargoes imported across our quays are destined for the Oslo region, which itself contains a third of the country�s population. 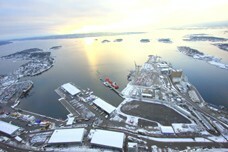 Facilities at the Port of Oslo are already among the most modern in Scandinavia, but the port is developing apace. Port operations are to be streamlined and the years ahead will bring major changes both to the look of the city and to the port itself. Freight handling, port calls, depot facilities and transport options will improve substantially over the next ten years. In world connection cruise have had a growth of 8% yearly. This year, Oslo did participate in this growth and experienced 2008 as all time high. This as a fact, the cruise season for 2009 may turn out to be a good one, with more registered ships than ever before. Early this year 2008 was promised to be the best cruise season ever, and that came through. The number of calls increased with 6,5 %, from 138 ship during 2007 to 147 for 2008. Oslo was beaten by Bergen which had 254 calls in 2008. With more than 7000 passengers than Bergen, Oslo is although Norway�s biggest cruise port. The ships that are visiting the main capitol, are the biggest, with averagely 1629 guests per ship, while the ships heading for Bergen have an average of about 914 per ship. About 240 000 passengers have visited Oslo when the season are closing, and that�s an increase of 25%. The reasons for the cruise record in Oslo, is targeted marketing through several years in co-operation with Visit Oslo and Oslo Cruise Network, and the fact that the ships are bigger than ever with an increase in gross tonnage of 13,8%. Cruise is the kind of holiday that has an enormous growth. The entity of 43 new cruise ships are reserved before 2010, and Oslo will probably have an increase in calls for the future. This is confirmed from the 153 registered ships for the 2009 season. World wide cruise has had a growth of 8% yearly. In USA 12% choose cruise for their holidays, while in Europe only 1, 5% does. That should give a possibility for an increase in the amount of cruise tourists from Europe.